When we first moved into the house we are currently renting three years ago, there was this cute little flower bed near the front door. And, in this bed was a tall plant hanger. I immediately forgot about my black thumbs and decided I needed some “pretty flowers” to hang there. So, off to the store I went with John and Ella still in my belly. I decided that the dark purple flowers were pretty and they were already in baskets ready to hang. I couldn’t wait to get home and hang those puppies up! As soon as we got home, that’s exactly what I did. They were so pretty and I’m sure I must’ve squealed and/or clapped, which is my typical reaction when I think something looks just too perfect. As time went on, I did a crazy dance back and forth with these flowers. I’d forget about them and then see them browning, so I would frantically get a cup of water to revive them. But, it didn’t take much longer until those pretty purple flowers went bye-bye. I’ve noticed that when your family is in a season of having babies, something usually gives. For some it’s cooking, for some it’s cleaning, for some it’s the yard, for some (like us) it’s a small bit of everything. Those poor pretty purple flowers were one of the things in our yard that totally bit the dust and we never looked back. Here is what makes you so glad to not have to be our neighbor…we are just classy enough to have kept the plastic hanging baskets on the plant hanger! Oh my word, I can’t even contain my laughter as I sit here and think about how those tacky plastic baskets have hung there for three years with only the first few months of those three years even containing any flowers. What makes you even happier that you’re not our neighbor or our family, is that my mother in law totally tried to help us out in the tacky area by filling the baskets up with pinecones from our yard. Ya know, trying to help us not look like the complete freaks of the whole city when most people around here have nice landscaping. So, there the baskets have sat. Full of pinecones for 2.5 years. Then, our sweet, precious, handsome miracle of a son, Warner lived on this earth for under an hour and went to be with Jesus. We were so incredibly blessed that family and friends dropped what they were doing to come into town to mourn with us. But, my father in law mowed our lawn and trimmed our bushes while he was here. While trimming the bushes, he accidentally whacked one of the plastic pieces of the basket that was holding it up. John showed it to me the day after and I completely cracked up. Beauty out of the ashes. All hope was lost. The container was falling apart. The pinecones threatened to choke out the beauty. But, when it’s time for beauty to arise, there’s nothing that can stand against it. No one in their right mind would ever expect hope to spring up in that flower basket. It had been neglected and forgotten about for years. There had not even been a glimpse of the possibility of a flower for 2.5 years. 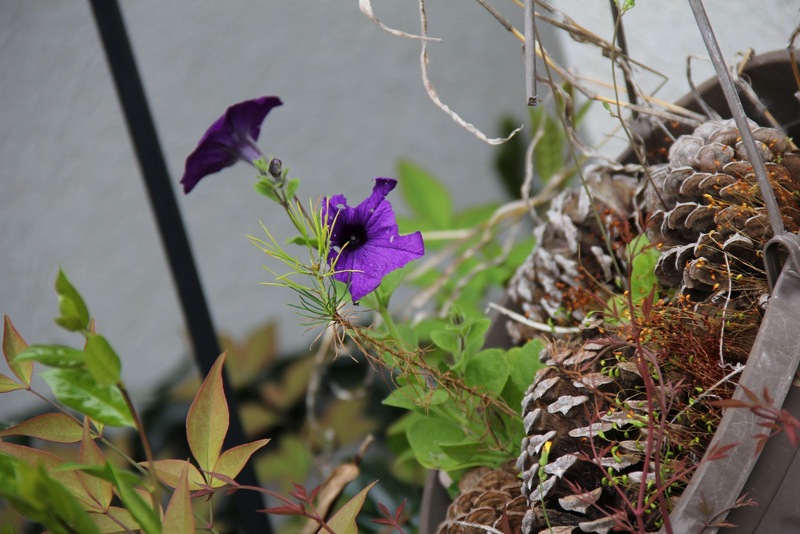 Even the basket was barely hanging on by the time the flower bloomed. But, even despite the container seemingly falling apart, at least it was still hanging on. We are still hanging on. I don’t understand how beauty can spring up during the ugliest of situations. I don’t understand how all of the surroundings can point to despair, yet hope takes its rightful place. I can assure you that it was no accident that those tacky plastic hanging baskets have hung full of pinecones for years. This day was coming just for me. 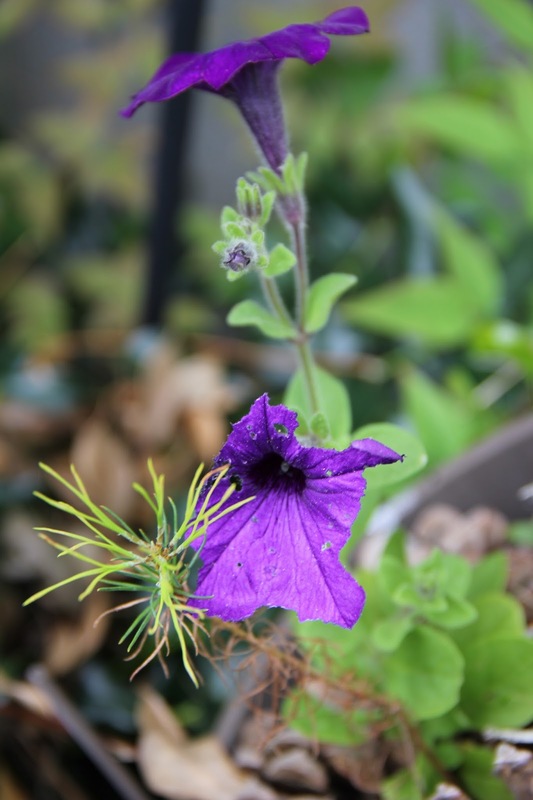 That little purple flower spoke volumes of God’s beauty, hope, and light in the middle of the darkest of situations. We have been praying and will continue to pray that Warner’s life would shine the beacon of hope in Christ to a dark and ugly world. 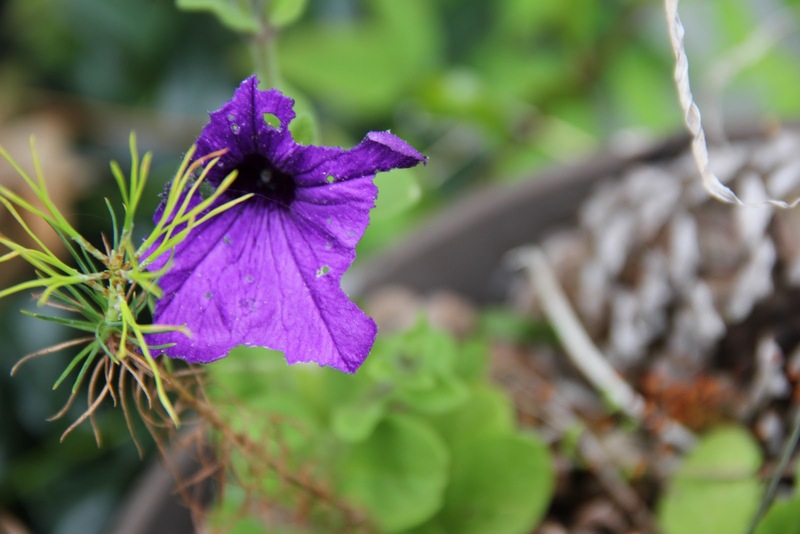 And, that little flower has proved just that hope.